I’m going to make some generalizations about water treatment that are based on information from a single advertising brochure: Pentair’s ChlorPlus Series information sheet. 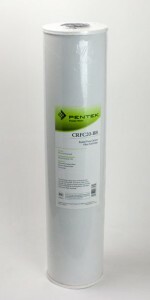 The sheet gives performance data for two Pentair cartridge series, the ChlorPlus carbon block filters in four standard sizes and the unique CRFC radial flow carbon series in two high-flow sizes. Carbon reduces both chloramine and chlorine. Although specialty carbons are often used to enhance chloramine reduction, any carbon filter will remove chloramine if you give it enough contact time. This is contrary to information supplied by some anti-chloramine groups which would have it that chloramine is “impossible” to remove. And, in answer to another frequent question, filters that remove chloramine also remove chlorine. Carbon lasts much longer when treating chlorine than it does when treating chloramine. The ChlorPlus 10 (9.75″ x 2.5″ drinking water size) is rated for 50,000 gallons at 1 gallon per minute (gpm) when treating chlorine and only 1,000 when treating chloramine at the same flow rate. This fifty to one ratio is typical. Performance and longevity vary considerably according to flow rate. The CRFC20-BB “whole house” 4.5″ X 20″ cartridge has a chloramine capacity of 25,000 gallons when treating a flow stream of 2.5 gpm and only 10,000 gallons when the flow rate doubles to 5 gpm. This has interesting implications if you’re buying a whole house filter. Consider what happens if you need to treat five gallons per minute and you use two filters and split the stream between them. When compared with the single filter, the two-filter system doesn’t treat twice as many gallons; it treats five times as many gallons. At 5 gpm, one filter has a 10,000 gallon service life, but two filters at the same flow rate have a 50,000 gallon life expectancy. Pressure drop across a filter increases greatly as flow rates increase. The CRFC20-BB reduces water pressure by 2.5 psi at a 5 gpm flow rate and less than 1 gpm when flowing at 2.5 gpm. The faster the flow, the greater the pressure drop: another excellent reason to split your whole house service stream between two filters installed in parallel. 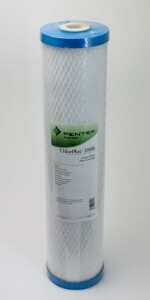 The principles above apply not only to Pentair cartridges and not only to chloramine and chlorine reduction. For large, tank-style filters with granular carbon, for example, you’ll get much longer service life and less pressure drop if the unit is adequately sized. A carbon backwashing filter designed to handle a 4 gallon per minute flow will “work” if you run six or seven gpm through it, but the carbon with need replacement much sooner and you’ll experience greater pressure drop than you would with a filter designed to handle 6 gpm comfortably.